When Nikunj Batheja founder of homigo first moved to Bengaluru, He faced the problem of finding a place to stay. His experience of hunting for a place and a series of problems he faced gave birth to Homigo. Homigo is a platform that provides working professionals with fully-furnished houses on a shared basis where you can live with your family, friends, and girlfriend/boyfriends without any disturbance like your own home only. You have to just come with your clothes and other necessary things will be provided by Homigo such as Bed, Bedsheet, Pillow, blanket, Sofa, Center table, TV, a Setup box, Fridge, Wifi, Modular kitchen with utensils, Gas connections and oven etc. Homigo also gives you a private 1BhK Flat on rent. 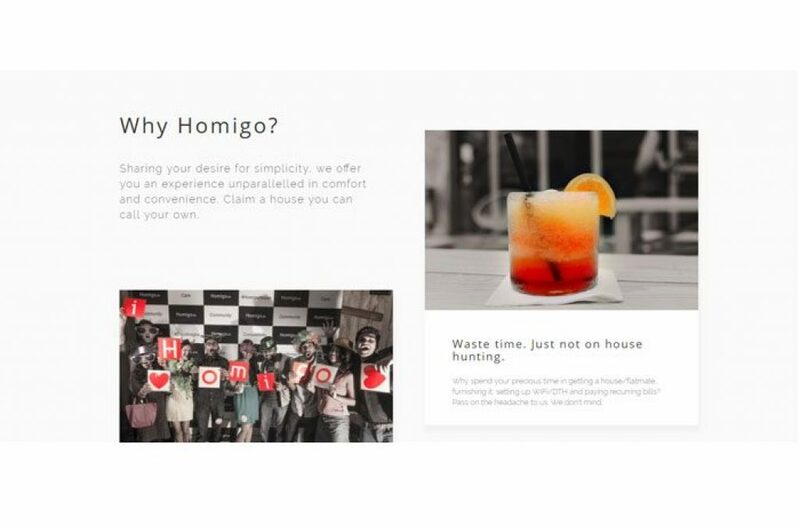 Homigo is founded by IIT Kanpur Alumni Nikunj Batheja who came to Bangalore and suffered a lot to get a room on rent and got an idea that everyone will be having the same problem and he founded homigo. His idea was simple both owners and tenants want freedom from dealing with each other and which leads to the born of Homigo.